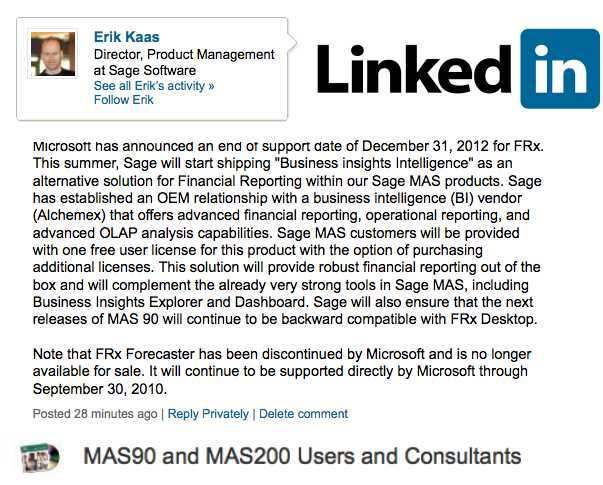 Sage yesterday announced on LinkedIn that Alchemex is their new reporting tool that will be bundled with MAS90/200 and serve to replace the FRX Report Writer which Microsoft is retiring in 12/2012. It’s possible I missed a public announcement about the replacement for FRX Financial Reporting for the Sage MAS90 and MAS200 product line. While Alchemex has been informally discussed during internal Sage Business Partner roadmap sessions – the only other indication that it was being considered was reportedly during comments public customer demonstrations made at the Sage Summit customer conference. As we’ve discussed before, FRX is being discontinued at the end of 2012. FRX is a financial report writer bundled with MAS 90 and MAS 200 General Ledger. It has advanced capabilities (consolidations, formatting, structure) that larger companies use to create custom financial statements based on their MAS 90 or MAS 200 General Ledger data. Microsoft owns the product and made a decision in 2008 to discontinue FRX support. The exact discontinuation schedule changed a few times until it arrived at the final end-of-life date of December 2012. This means that all software publishers (including Sage) who offered FRX as their primary financial reporting tool needed to either write their own financial reporting package or scramble to find a suitable replacement in advance of the 2012 deadline. There had been some informal indicationis that Alchmex, an Excel-based reporting tool, would be the replacement. This program is already used in the Accpac, Sage ERP X3 product lines to create financial reports. Until now I have not seen any public announcement to users or the Sage channel about the use of Alchemex as the replacement for FRX . Microsoft has announced an end of support date of December 31, 2012 for FRx. This summer, Sage will start shipping “Business insights Intelligence” as an alternative solution for Financial Reporting within our Sage MAS products. Sage has established an OEM relationship with a business intelligence (BI) vendor (Alchemex) that offers advanced financial reporting, operational reporting, and advanced OLAP analysis capabilities. Sage MAS customers will be provided with one free user license for this product with the option of purchasing additional licenses. This solution will provide robust financial reporting out of the box and will complement the already very strong tools in Sage MAS, including Business Insights Explorer and Dashboard. Sage will also ensure that the next releases of MAS 90 will continue to be backward compatible with FRx Desktop. Note that FRx Forecaster has been discontinued by Microsoft and is no longer available for sale. It will continue to be supported directly by Microsoft through September 30, 2010. Update January 18, 2010: According to Sage every MAS90/200 user will get 1 free license as part of the MAS 90 v4.4 Product Update. In addition, they are reviewing a “trade in” program to allow customers that have purchased additional FRx licenses to exchange them for equivalent BI Intelligence licenses. Sage is investigating if and how custom FRx reports can be converted to the new format and we will make a utility available to assist with the conversion. However, since FRx is a proprietary format it is unlikely that the utility will be perfect – but it should minimize the costs of conversion. This is the second time a major announcement has debuted on the Sage MAS90 LinkedIn group. 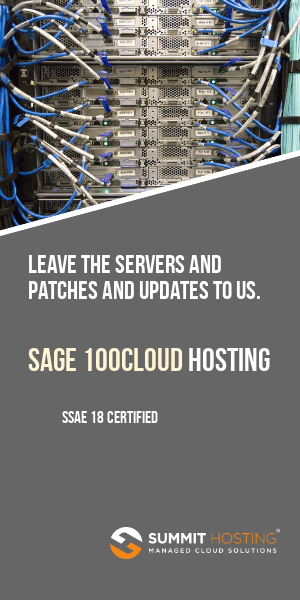 The first announcement was earlier this month when Sage stated they would support MAS90/200 v4.3 on Windows 7 with the expected release of Service Update 18 in March 2010.